Ultrawide monitors are great for both gaming and office work. They have more screen real estate, which is beneficial for productivity, and offer a more immersive gaming experience. They also look better than a dual monitor setup because there is no black border in the middle. However, not all ultrawide monitors are worth it. Some products are simply better than others, offering better value for the money. In this guide, we have compiled the best ultrawide monitors currently out on the market, from relatively budget-friendly options to high-end monitors designed specifically for serious gaming. The LG 29WK600-W is the best option if you want an affordable ultrawide monitor that works well for productivity and general use. It’s a 29-inch monitor with a 2560×1080 resolution and a native refresh rate of 60 Hz. It has a simple design that will fit well in any setting and includes three input options: a pair of HDMI ports and a DisplayPort. Featuring an IPS panel with an anti-glare screen coating, this LG product is a flat ultrawide monitor with a minimalist design. It comes with a fixed-height stand that offers tilt as the only adjustment option, and it features surprisingly decent-sounding speakers(Here’s some desktop soundbars if you’re into that). All connection ports are outward-facing on the back panel, which makes them easy to access. The 29WK600-W has good overall picture quality, with wide viewing angles, decent peak brightness, and good color accuracy. While it supports HDR content, it can’t display them properly, simply because it’s not equipped with the right hardware to do so. On the plus side, the 29WK600-W is also decent for regular gaming, featuring FreeSync technology for smoother gaming. Overall, this LG product offers good value for the money and is a recommended ultrawide display if you want an affordable option. Selling for around $400-450, the Samsung S34J55W is a 34-inch flat ultrawide monitor that uses a VA panel with a 3440×1440 resolution and a max refresh rate of 75 Hz. 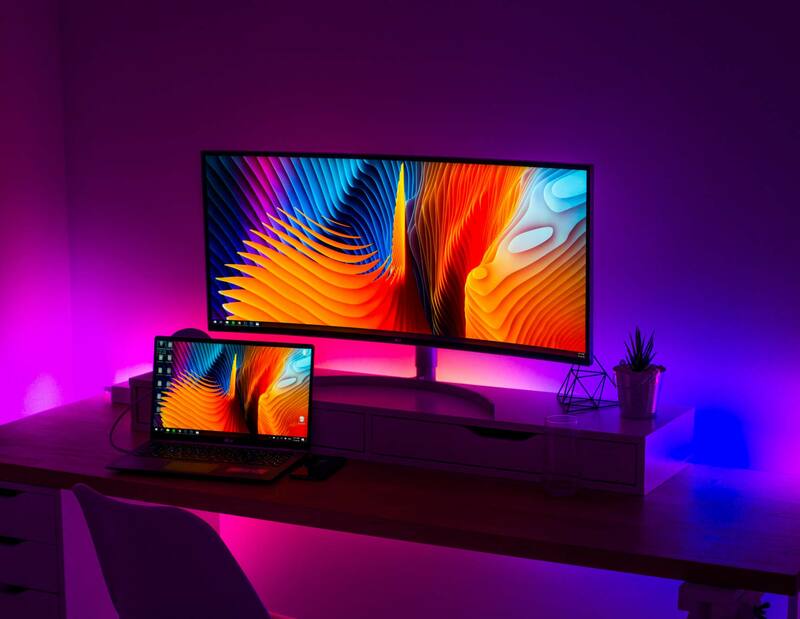 Like the budget LG monitor above, this Samsung display is suitable for office work, regular gaming, and media consumption, although it has narrower viewing angles, which could be a problem when using it for productivity. The S34J55W has a plain design with decent build quality, featuring a small joystick control at the back for faster menu navigation. The input ports, which include two HDMI ports and one DisplayPort, are also located at the back, along with the audio out port. If you want to mount the monitor to a wall mount or a flexible monitor arm – which is actually the recommended course of action since the monitor stand has limited adjustability – there is an easily accessible VESA mounting interface at the back, right next to the connections hub. Regarding performance, this Samsung monitor is solid. The overall picture quality is good, with good color accuracy and excellent contrast, both of which are beneficial when watching movies and playing games with pretty graphics. It’s a good monitor for multitasking, with the large screen and high resolution allowing for easy management of multiple windows. If you want a relatively affordable VA ultrawide monitor that’s good for all-around usage, consider the S34J55W. A flat ultrawide monitor, the LG 34UM88C-P is a great monitor for all-around use, featuring a 34-inch screen, a 3440×1440 resolution, a USB hub, and FreeSync support. It has the same minimalist design as the LG 29WK600-W that works well in a typical office setting, with thin bezels at the top and sides and a plain back panel. The 34UM88C-P is an IPS monitor with a 60 Hz refresh rate, which is more than enough for office work and general use. Like most LG monitors, it has a small joystick at the bottom for navigating the on-screen display (OSD). For connectivity, the monitor has one DisplayPort, two HDMI ports, one audio out, and two USB 3.0 down ports. You can use this monitor for different types of work, including photo editing and coding. It has good picture quality, with wide viewing angles and great color accuracy, the latter of which is important in color-critical work. You can also use it for gaming, but not for fast-paced competitive games where fast response times and high refresh rates are more important than picture quality. It’s a great product overall and is better than the LG 29WK600-W in several areas. Often considered the best ultrawide monitor for productivity, the Dell U3417W is an excellent display, featuring an IPS panel with a 3440×1440 resolution and a 60 Hz refresh rate. It comes with a well-built stand with decent ergonomics and features a lot of connection ports. The U3417W is a curved ultrawide monitor with a curve radius of 1900R, which translates to a sharper or more aggressive curvature. It’s got a professional design similar to other monitors in the Dell UltraSharp series, with narrow bezels at three sides and a clean back panel. Of the monitors in this guide, it has the best connectivity, featuring two HDMI ports, one DisplayPort, one Mini DisplayPort, one DisplayPort Out, one audio out, and four USB 3.0 down ports. The DisplayPort Out is useful for setting up a daisy chain, a multi-monitor setup in which only one monitor is directly connected to the computer. A brilliant monitor for office work, the U3417W has good overall picture quality, boasting excellent color accuracy and great viewing angles. You can easily multitask on this monitor, thanks to the large screen and high resolution. While not as good as gaming-focused monitors, this Dell product is also good for regular gaming, which makes it a well-rounded monitor suitable for different applications. The Asus ROG Strix XG35VQ is the opposite of the Dell U3417W, putting more focus on gaming performance. While it has the same resolution, it uses a different panel and boasts a higher refresh rate, which is great for gaming. It’s got a VA panel and a 100 Hz refresh rate, with the former automatically translating to a higher contrast ratio compared to IPS monitors. A 35-inch display, this Asus gaming monitor has a curved screen with a sharp curve radius of 1800R, which makes for a more immersive experience, especially when playing racing games. The monitor has a stylish design – which is common among Republic of Gamers (ROG) products – featuring a cool lighting system on the back panel. It comes with an adjustable stand and includes multiple video input ports as well as a USB hub. Featuring a good response time, a low input lag, and FreeSync support, the XG35VQ is an excellent monitor for pure gaming, with the high contrast ratio translating to vibrant images with inky blacks. If you mostly play survival horror games, open-world RPGs, and racing games, you’ll love this Asus gaming monitor. The Acer Predator Z35P is basically the G-Sync equivalent of the Asus ROG Strix XG35VQ, featuring the same screen size, resolution, panel type, and native refresh rate. The curved screen has the same 1800R curvature as well. If you like the Asus gaming monitor but prefer G-Sync over FreeSync, get this Acer monitor instead. The Z35P is a well-designed unit, featuring a thick but stylish chassis with red accents in some areas, most notably at the top and bottom edge of the back panel. It has a 3440×1440 resolution and a 100 Hz standard refresh rate, which can be easily overclocked to 120 Hz. The input ports are positioned downward at the rear, along with the headphones port, while the USB ports are outward-facing on the back panel. Like the Asus gaming monitor above, the Z35P has a fast response time and a low input lag, both of which are great no matter what kinds of games you play. When G-Sync is enabled, the monitor adapts to the graphics card output, which is especially beneficial when playing graphically intensive games at high settings. You can also use this monitor for office work, but it’s not as good as the Dell U3417W on that front. One of the best curved ultrawide monitors on the market, the Dell Alienware AW3418DW is a 34-inch display with a 3440×1440 resolution and a 100 Hz standard refresh rate. Unlike the Asus and Acer gaming monitors above, this one uses an IPS panel, which means it has better viewing angles. A G-Sync monitor, the AW3418DW has a futuristic design that will attract a lot of attention, featuring a multi-zone lighting system, which is customizable, and a stylish stand with a large footprint. The curve radius of the screen is 1900R, which is identical to the Dell U3417W. In addition to the DisplayPort and HDMI input ports, the monitor has a USB hub and a couple of audio out ports, one of which is a dedicated headphones port with direct volume adjustment. Regarding performance, this Dell Alienware monitor is simply outstanding, boasting a fast response time, a very low input lag, and consistent G-Sync performance. It has good color accuracy and good peak brightness. You can also use this monitor for productivity or office work, so if you want an all-around unit that offers better gaming performance than the Dell U3417W, get this product instead. The Samsung C49HG90 is a massive ultrawide monitor, featuring a 49-inch screen, which is one of the largest out there. While it’s clearly built for gaming, you can also use it for productivity, provided you are cool with the low pixel density since the resolution is only 3840×1080. A VA monitor with a curved screen, this Samsung monitor has a nice design and will easily turn a lot of heads. It’s got a thick chassis with narrow bezels, a lighting system, and an intuitive menu control system in the form of a small joystick. For video input, the monitor has DisplayPort, Mini DisplayPort, and HDMI, all of which are down-firing at the rear. Featuring a 144 Hz refresh rate, the C49HG90 is a suitable monitor for gaming, with the sharp-curved screen (1800R curve radius) allowing for a more immersive experience, especially when playing racing games and flight simulators. It has a fast response time and a low input lag and supports FreeSync for reduced screen tearing when the graphics card output is erratic. The picture quality is also good, with superb contrast, decent HDR performance, and great color accuracy. All in all, the C49HG90 is a great option if you want an ultrawide gaming monitor larger than 40 inches. If you like the Dell U3417W but prefer a bigger screen and a higher resolution, check out the Dell U3818DW, which is around $300-400 more expensive. It’s an outstanding monitor, capable of connecting to two computers at the same time, with seamless switching between them, which is great for productivity. The U3818DW is a 38-inch curved ultrawide monitor with an IPS panel, a 3840×1600 resolution, and a standard 60 Hz refresh rate. Compared to the Dell U3417W, this monitor has a softer curve radius of 2300R, which means the curvature is not as aggressive. The screen has an anti-glare coating, which helps when using the monitor in a bright room. For input, the U3818DW has HDMI and DisplayPort, along with USB-C, which supports video input, data transfer, and power delivery using only a single cable. If your work requires you to constantly look at references in a different window, you’ll love this monitor. It’s great for multitasking with three or four windows open at the same time and for viewing financial graphs or charts in full-screen. Regarding picture quality, the U3818DW is good, with excellent color accuracy and wide viewing angles. If the Dell U3417W is still too small for you, go for this monitor – which is also under the Dell UltraSharp series – instead. A 34-inch IPS monitor, the LG 34GK950F-B is a curved ultrawide monitor designed specifically for gaming, featuring a fast response time, a low input lag, and FreeSync support. The native resolution is 3440×1440 while the refresh rate is 144 Hz, which ties it with the Samsung C49HG90 for the highest refresh rate among the products in this guide. Selling for around $1,200, this LG monitor has a more stylish design compared to most other LG ultrawide monitors, with red accents in some areas. The monitor is well built and comes with a sturdy stand that easily supports the 34-inch screen. The input ports – composed of one DisplayPort and two HDMI ports – are outward-facing at the back, along with the USB hub and headphones port. A VESA certified DisplayHDR 400 monitor, the 34GK950F-B has good overall picture quality, which is great if you mostly play single-player games with gorgeous visuals. The color accuracy is good while the viewing angles are great. If you can spend more than a grand on an ultrawide display and want a gaming machine that also works well for office work and general use, consider the 34GK950F-B. From 25-inch and 29-inch to 34-inch and 38-inch, ultrawide monitors – which have a 21:9 or 32:9 aspect ratio – come in different screen sizes, with 34-inch being the most common. For productivity, larger screens are the most suitable since they offer more space, which makes it easy to work with multiple windows open at the same time. For gaming, larger screens are also recommended, especially if you want a more immersive experience and play a lot of racing games, flight simulators, and open-world RPGs. On the other hand, smaller 25-inch and 29-inch ultrawide monitors take up less space and typically come with a 2560×1080 native resolution, which is easier on your graphics card, especially if the monitor has a refresh rate higher than 100 Hz. In addition, ultrawide monitors smaller than 30 inches are more affordable, with some models selling for just around $300 or less. If you want an ultrawide display larger than 30 inches but don’t have enough desk space, you can always go for a wall-mounted setup. Most ultrawide monitors feature a VESA mounting interface at the back, so one half of the setup is already taken care of – all you need to do is buy a compatible mount. A lot of ultrawide monitors feature a curved screen, especially the more recent ones. If you do a quick search at online stores, there is a good chance the first page will be mostly composed of curved ultrawide monitors. A curved screen is better implemented on ultrawide monitors than on flat displays with a 16:9 aspect ratio, especially if the screen size is larger than 30 inches. However, curved ultrawide monitors are not automatically better than their flat counterparts, although manufacturers often say otherwise. They are great for gaming and watching movies since they make for a more immersive experience, but for productivity, they are a mixed bag. They are good for coding, spreadsheets, content writing, and other similar types of work. But for computer-aided design (CAD) software, graphics design, and other related fields where there are a lot of lines involved, curved monitors are not the most ideal. The listed curvature of a curved ultrawide monitor (e.g. 1800R, 3800R) refers to the radius of the circle formed with multiples of that monitor, measured in millimeters. For example, the Acer Predator Z35P has a listed curvature of 1800R. This means if you form a circle using multiples of that monitor and measure the distance from the center to the perimeter, the radius would be 1800 millimeters. The lower the number, the sharper the curvature. Monitors with a listed curve radius of 1800R and 1900R feature a more pronounced or sharper curve. They offer a more immersive experience and are most suitable for gaming, especially if you love to play racing/driving simulators. They typically have a thicker chassis, which means they take up more space. Meanwhile, 3800R curved ultrawide displays have a less pronounced or softer curve and usually come in a thinner chassis. They are great for productivity and are also good for gaming, but they don’t offer the same immersion as curved ultrawide monitors with sharper curvatures. Don’t make your decision based solely on the monitor’s curvature, though. There are other things to consider. Besides, what works for most people may not work for you, or vice versa. For example, you might find working on sharp-curved monitors perfectly fine even if your work is design-related and involves a lot of straight lines. If you don’t like a curved screen, there are also flat ultrawide monitors, but there aren’t many of them. Since they have a much wider screen, ultrawide monitors are different from regular monitors regarding resolution. The three common resolutions – 3840×2160, 2560×1440, 1920×1080 – don’t apply to them since those are only applicable to 16:9 monitors. For ultrawide monitors, the two most common resolutions are 3440×1440 and 2560×1080. When considering the resolution, consider the screen size as well since it affects the pixel density of the monitor. A 2560×1080 resolution is good enough for 25-inch and 29-inch ultrawide monitors – the pixel density for the former is similar to a 27-inch QHD monitor; for the latter, the pixel density is similar to a 24-inch FHD monitor. For monitors larger than 30 inches, you’ll want a higher resolution, most especially for productivity. Keep in mind that a higher resolution requires a more powerful graphics card, especially if the monitor has a refresh rate higher than 60 Hz. If you are going to use your monitor strictly for fast-paced games and want consistent performance, you may want to go for a 2560×1080 monitor since it’ll be easier on your graphics card. If you mostly play triple-A single-player games with pretty graphics, consider an ultrawide monitor with a higher resolution instead, but make sure your computer can actually handle it. As mentioned above, you’ll want a higher resolution (e.g. 3440×1440, 3840×1600) for productivity or office work, especially if you love to work with multiple windows open at the same time. There are three panel technologies used in monitors: In-Plane Switching (IPS), Vertical Alignment (VA), and Twisted Nematic (TN). Since there are no TN ultrawide monitors, we’ll just focus on the former two panel types. IPS monitors have the best color reproduction and viewing angles. They are the most suitable for productivity, especially for color-critical work such as photo editing and graphics design. They are also good for gaming, with many IPS ultrawide monitors offering fast response times and good input lag, both of which are beneficial in gaming. On the other hand, IPS monitors have a subpar contrast ratio and are generally more expensive than VA monitors. VA monitors have decent picture quality. They offer the best contrast ratio among the three panel types, which translates to more vibrant images when gaming and watching movies. They have narrower viewing angles and slower response times compared to IPS monitors, though, but for the latter, the difference is not that wide. If you are going to use your ultrawide monitor primarily for productivity, go for an IPS monitor. If you are going to use your display mostly for gaming, both IPS and VA monitors are good options – the former is better if you want wider viewing angles and slightly faster response times while the latter is more suitable if you want a higher contrast ratio. Measured in Hertz (Hz), the refresh rate is the number of times a monitor refreshes or redraws the image on the screen per second. A higher refresh rate translates to increased smoothness, which is especially beneficial in fast-paced games. Ultrawide monitors designed specifically for productivity usually feature a 60 Hz refresh rate, which is more than enough for their intended purpose. On the other hand, ultrawide monitors built specifically for gaming usually feature a 100 or 144 Hz refresh rate, with some models offering the option to overclock to 120 Hz for the former. There are also 60 Hz ultrawide gaming monitors that can be easily boosted to 100 Hz. If you are going to use your ultrawide monitor strictly for productivity, a 60 Hz display is more than good enough. The same goes if you are going to use it for both office work and console gaming since console games typically don’t go over 60 frames per second. For PC gaming, it depends on your preferences, including what kinds of games you play. If you mostly play fast-paced games and/or want everything to be as smooth as possible, go for an ultrawide monitor with a 100 or 144 Hz refresh rate. If you want consistent performance, settle for a 2560×1080 monitor with a high refresh rate, which is less demanding than a 3440×1440 monitor with a high refresh rate. If you mostly play role-playing games, survival horror games, and other slow-paced single-player games where you’ll appreciate good picture quality more than anything else, don’t make high refresh rates a priority when shopping for the best ultrawide monitors. Instead, put more focus on the resolution, panel type, and other aspects related to overall picture quality. G-Sync and FreeSync are adaptive synchronization technologies usually featured in monitors, most especially those intended for gaming use. They allow for variable refresh rates, dynamically adapting the monitor refresh rate to the graphics card output, which is variable. For instance, if the graphics card output drops to 50 frames per second, G-Sync/FreeSync will change the monitor refresh rate to 50 Hz. This eliminates screen tearing – which is when the monitor is displaying multiple frames at once with horizontal lines or “tears” across the screen – as long as the GPU output is within the G-Sync/FreeSync effective range. G-Sync and FreeSync are most beneficial when playing graphically intensive games at max or near-max settings. The graphics card will be under a lot of strain in that setup, resulting in an erratic output; with G-Sync/FreeSync, the output on the monitor stays smooth since the monitor is adapting to the graphics card in real-time. While they are essentially the same in functionality, G-Sync and FreeSync are implemented differently. G-Sync was developed by Nvidia and is considered the more premium technology. G-Sync offers stable and consistent performance, with a wide effective range, since Nvidia is very strict when it comes to the implementation of its technology. On the other hand, G-Sync monitors only work with Nvidia graphics cards and are significantly more expensive since they require proprietary hardware sold by Nvidia, which drives up the price. FreeSync is an AMD technology. FreeSync monitors vary in performance since manufacturers have more freedom in how the technology is implemented. Some offer excellent performance, with a wide effective range, while others exhibit issues when the feature is enabled. FreeSync monitors are more affordable and are more widely available. And unlike with G-Sync monitors, some FreeSync monitors work with certain Nvidia graphics cards, in addition to native compatibility with AMD graphics cards. If you are going to use your ultrawide monitor for productivity only, then G-Sync and FreeSync will not be beneficial for you. For gaming use, it depends on your preferences. If you easily notice screen tearing and find it unbearable or mostly play graphically intensive games at very high settings, then monitors with adaptive sync are for you. If you don’t care about screen tearing or own a powerful gaming PC that can easily keep up with 100 or 144 Hz monitors, then you might not fully appreciate the benefits of G-Sync/FreeSync. If you want the best ultrawide monitor for all-around use, get the Dell Alienware AW3418DW. It has good picture quality and boasts excellent gaming performance. You can use it for productivity, media consumption, and serious gaming. If you want a relatively more affordable option that’s great for office work and is decent enough for regular gaming, go for the Dell U3417W instead.